On June 30, 2017 Casting for Recovery (CfR) packed up the Manchester, VT office and shipped everything to Bozeman, MT..to open the new CfR office. 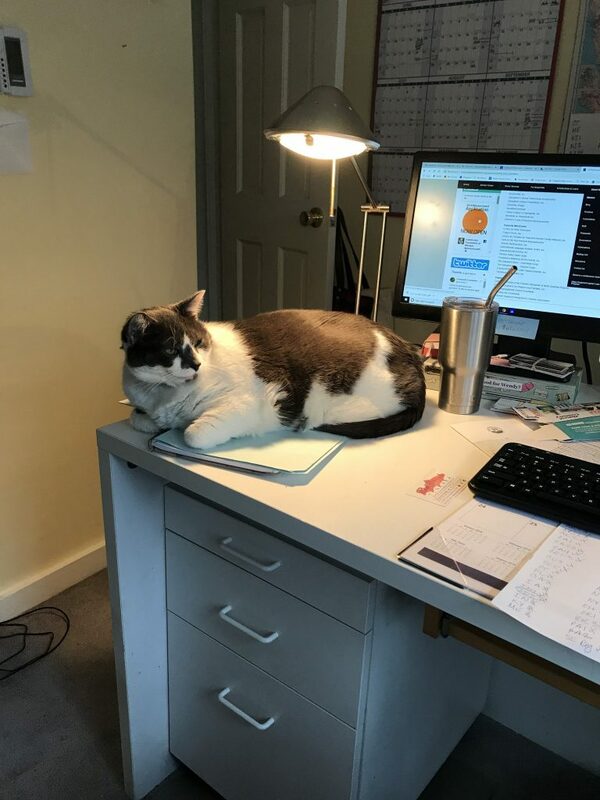 This meant that myself and two other Vermont colleagues began working from home full-time. For me this was quite a transition since all my jobs have been out of the home. I set up a home office in my upstairs den with a desk from the VT office, a large US map, my bulletin board and a filing cabinet. After many tweaks to the space I have created a warm and cozy office that works for me. There are many benefits from working at home – preparing lunch vs. brown bagging it; throwing a load of laundry into the washer/dryer; stepping out your door to go for a walk on a beautiful day; flexibility with appointments and most importantly getting dinner ready. But working from home was quite a transition for me from being in an office with people to being alone until my husband Joe gets home at 3:30. But wait…I’m not alone, I have Jack and Rocky! They are our 6 year old cats we adopted as kittens from the local shelter. They are litter mates and love and hate each other. Jack is the more active one and loves sitting on my desk in front of my screen, on my keyboard and holding my hand. Rocky on the hand is not active and has never turned down a treat or a meal. His time is spent crying out for me to fill his food dish. To say they are a nuisance and hindrance to working from home is an understatement! 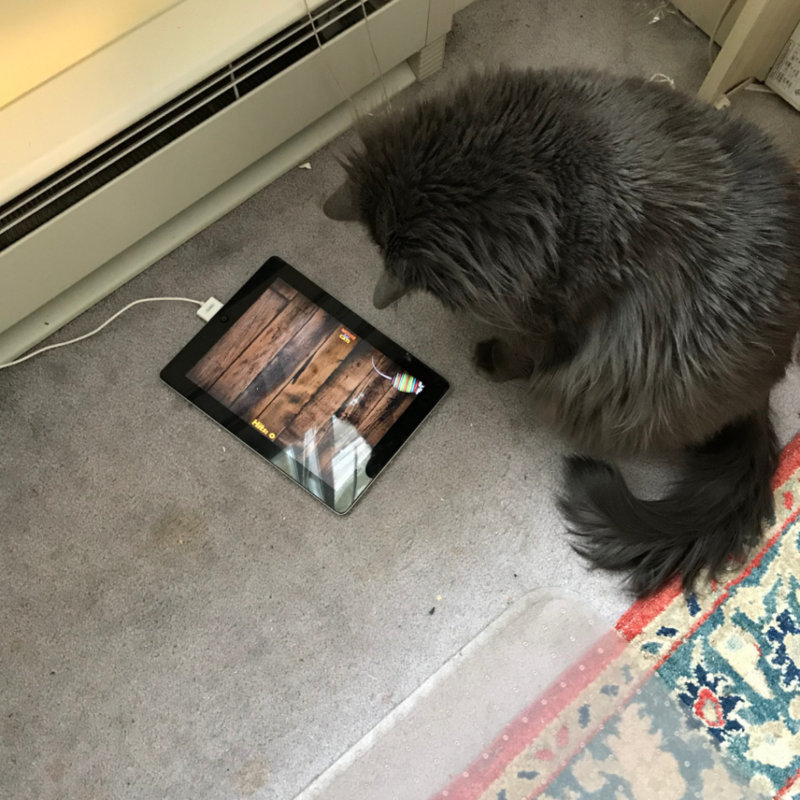 During one of my calls with Erika Michanowicz, my colleague, she mentioned an app that she downloaded for her cat that is a mouse game. I thought…aha here is my answer for pesky cats. So I got the app on my phone and let Jack play the game and he loved it! But this became a problem when I had to use my phone for work and he wanted to play the game. So I set up my iPad for him – off my desk – and it worked like a charm. By this time Rocky had gotten in on the action and they both began pounding on my iPad whenever the mouse appears. They have gotten very proficient at the game and spend hours staring at the screen and I can work without interruption for hours. Working from home may mean not working with human beings but luckily I have Jack and Rocky so I am never alone.